Editor’s Note: This is the first article in a year-long series that focuses in on the details and more technical aspects of one common thing precast concrete producers do on a daily basis. Ask among precasters, and you’ll hear all sorts of unique ways aggregate moisture content has been tested over the years. Can you tell by grabbing a handful of aggregate and squeezing? Can you tell just by looking at it? How about picking up some sand, throwing it against a concrete wall, and inspecting the damp mark left behind? Or, creatively, putting a clump of sand inside your cheek and giving it a little chew. Fortunately, reliable aggregate moisture content test methods exist today that provide precasters with accurate, consistent and repeatable results – and do not require you to ingest aggregate. Aggregates are porous materials capable of both absorbing moisture internally and adsorbing moisture on the exterior surface. Although we seek out hard, dense, clean, sound, stable and non-reactive aggregates for use in precast concrete, high-quality coarse aggregate still contain miniscule pores. These pores are capable of holding measurable amounts of moisture, which can drastically affect a concrete mix. Fine aggregate also need to be carefully monitored since they are susceptible to bulking, which causes fine aggregate to hold water between the aggregate particles. Aggregate moisture content fluctuates from day-to-day and can even change from hour-to-hour depending on how they are stored as well as exposure conditions like sun, wind, rain and humidity. Weighing and batching wet aggregate into a mix without accounting for its unique moisture condition at the time of batching would result in adding an insufficient amount of aggregate to the mix while adding excess water. The opposite is true when weighing and batching dry aggregate without accounting for their moisture condition. Aggregate bins with high walls keeps aggregate types and sizes separated. There are three commonly used test methods for performing moisture content tests of normal-weight and lightweight aggregates. ASTM C566, “Standard Test Method for Total Evaporable Moisture Content of Aggregate by Drying,” is applicable to both fine or coarse aggregate and is the most commonly used procedure. ASTM C70, “Standard Test Method for Surface Moisture in Fine Aggregate,” is another test method but is only for use on fine aggregate. It is less widely used because its procedure is more involved and relies on measuring displaced volumes. AASHTO T255, “Standard Method of Test for Determining Total Moisture and Free Moisture in Aggregate (Coarse and Fine),” is the third test method, which has many similarities to the method outlined in ASTM C566 and can also be used on both fine or coarse aggregates. However, it is typically used in preparation for hot-mix asphalt applications. The NPCA Quality Control Manual for Precast Concrete Plants requires plants to determine the moisture content of each aggregate at least once daily in accordance with ASTM C566 or ASTM C70. When plants use moisture probes or automatic mixing water adjustment systems, plants must still conduct an aggregate moisture content test on each aggregate at least once per week to validate the moisture probe accuracy and performance. A balance or scale that must be accurate to within 0.1% of the test load at any point within the balance’s range of use. A source of heat such as electric hot plate, gas burner, ventilated microwave oven or ventilated oven. Where close temperature control is required, the ventilated oven must be able to maintain a 110 degrees C ambient temperature plus or minus 5 degrees C. Where close temperature control is unnecessary, a hot plate or microwave oven is sufficient. A sample container that must be made of a heat-resistant material large enough to contain the sample during stirring, and of a sufficient width that the depth of the sample does not exceed one fifth of the sample container’s width. For example, if the sample container has a diameter of 10 inches, the depth of the aggregate sample must be 2 inches or less. If using a microwave oven or an oven to dry the sample, it may be helpful to use a wide, shallow sample container (like a heat-proof baking dish) that will allow the aggregate to lay in a thin layer. Only use non-metallic sample containers and equipment inside a microwave. If using a hot plate or burner to dry the aggregate, use a sample container that fits entirely, or close to entirely, on the hot plate rather than a sample container that extends over the edges of the heating surface to ensure consistent heating of the aggregate. A stirrer such as a metal spoon or spatula that is a convenient size and safe length. A heat-resistant glove or hot pad. First, ensure you have the necessary and properly functioning equipment and personal protective equipment readily available. Before collecting the sample, weigh the sample container. Turn the balance on and ensure it displays a measurement of zero. If the scale does not read zero, press the “clear” or “tare” option to reset it. Then place the empty sample container on the scale and record its weight to the nearest 0.1%, including the unit of measurement (ounces, pounds, grams or kilograms). It may be helpful to record the sample container’s weight directly on the sample container with a permanent marker. Be sure to validate this weight measurement periodically, but not less than annually. Collect a representative aggregate sample from the stockpile in accordance with ASTM D75, “Standard Practice for Sampling Aggregates.” The minimum aggregate sample weight needed for the test depends on the nominal maximum size aggregate of the aggregate being tested. 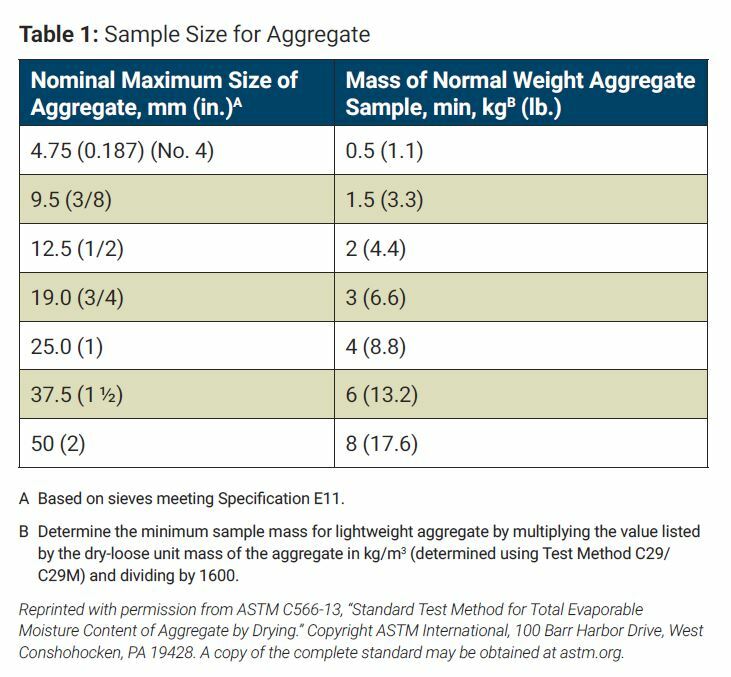 These minimum sample weights are outlined in “Table 1: Sample Size for Aggregate” in ASTM C566. The nominal maximum size aggregate can be found in the plant’s aggregate gradation documentation. Keep in mind the larger the sample size beyond the values required in Table 1, the longer it may take to conduct the test. Ensure the sample that is collected represents the entire stockpile of aggregate not only in size and gradation, but also in moisture content. The aggregate near the bottom edges of the coarse aggregate stockpile may be slightly larger in size than the general gradation of the entire stockpile, as bigger pieces have a tendency to roll to the bottom. Also, keep in mind the moisture content of the aggregate within the stockpile will vary depending on depth in the stockpile and environmental exposure conditions. Aggregate deep in the stockpile may be wetter since it is not exposed to the drying sun or wind. Conversely, aggregate on the surface of the stockpile may be wetter than those further down if there was a recent rain or if covered in morning dew. Ensure the collected aggregate sample is protected from moisture loss or gain prior to performing the test. Turn the balance on, ensure it reads zero and then place the receptacle containing the aggregate sample on the scale. Record the weight and the unit of measurement. This value is the combined weight of the sample container plus the aggregate sample. Next, subtract the weight of the sample container from the combined weight of the container plus the aggregate sample. Record the weight to the nearest 0.1% and include the unit of measurement. This value is the weight of the aggregate sample. If using a hot plate, place the sample container with the aggregate on the hot plate first and then turn it on. If using an oven, place the sample container with the aggregate inside the oven first and then turn on the oven. Rapid heating of coarse aggregate can cause some particles to explode, which is both a safety concern and will result in the loss of aggregate particles and skew the testing results. Allowing the heat source to gradually heat the aggregate can help prevent the aggregate from exploding. Gradually heat the aggregate sample using the selected method. If using a hot plate or burner, use the stirrer periodically during the heating process to help expedite moisture evaporation and to prevent localized overheating of the aggregate. When heating fine aggregate, it may tend to stick to the stirrer while it’s wet or damp. Carefully tap the stirrer on the side of sample container to remove any stuck-on aggregate and ensure it goes back into the rest of the sample for drying. If using a microwave or oven, stirring the sample during heating is optional. There is no set duration for heating and drying the aggregate sample. The amount of time needed to achieve oven-dry aggregate will vary depending on the size of the sample, the aggregate gradation, the method of heating and the wetness of the representative aggregate sample. Although the aggregate may appear to dry quickly to the naked eye, it’s imperative to ensure the pores within the aggregate are completely dry as well. Carefully watch the sample during the heating and drying process and never leave the sample unattended. Before removing the dry sample from the heat source, turn on the scale, place a hot pad on the scale, zero the scale by pressing the “clear” or “tare” button and ensure it shows a reading of zero with the hot pad on the scale. Carefully remove the sample container with the aggregate from the heat source using hot pads and place the sample container on the hot pad positioned on the scale. Ensure the heat source is turned off. Record the value to the nearest 0.1% including the unit of measurement. This value is the combined weight of the sample container plus the dried aggregate sample. Next, subtract the weight of the sample container from the combined weight of the sample container plus the dried aggregate sample. Record the weight to the nearest 0.1% and include the unit of measurement. This value is the weight of the dried aggregate sample. Using hot pads, carefully place the sample container back on the hot plate or burner, or back in the microwave or oven, and turn on the heat source. Continue to gradually heat the sample, taking care to consistently heat the sample. You may choose to continue stirring the sample. Continue to carefully watch the sample during the drying process. After some time of continued heating and drying and just before removing the sample from the heat source, turn the scale on, place a hot pad on the scale, zero the scale by pressing the “clear” or “tare” button and ensure it shows a reading of zero with the hot pad on the scale. Carefully remove the sample container with the aggregate from the heat source using hot pads and place the sample container on the hot pad positioned on the scale. Ensure the heat source is turned off. Record the value to the nearest 0.1% including the unit of measurement. This value is the combined weight of the sample container plus the secondarily dried aggregate sample. Next, subtract the weight of the sample container from the combined weight of the sample container plus the dried aggregate sample. Record the weight to the nearest 0.1% and include the unit of measurement. This value is the weight of the secondarily dried aggregate sample. Since there is no set heating duration that will result in perfectly oven-dried aggregate each time, it is important to carefully monitor the two dried aggregate sample weights that were recorded. The sample is considered sufficiently dry when further heating causes, or would cause, less than 0.1% additional loss in weight. Compare the two weights of the dried aggregate sample to determine how much additional loss in weight was achieved, if any, by the secondary drying period. Subtract the weight of the secondarily dried sample from the weight of the initial dried sample. Then divide this value by the weight of the secondarily dried sample. Then multiply this value by 100. If the resulting value is less than 0.1, the sample is considered sufficiently dry. However, if the value is greater than or equal to 0.1, the sample must be dried further. If additional drying is needed, repeat the same process as outlined above. The unit weight for a given volume of a sufficiently dry aggregate sample will be constant. Although not recommended, a sufficiently dry aggregate sample could be heated for hours, and both the final dried sample weight and the unit weight will remain the same. If the test procedure is conducted on another aggregate sample from the same stockpile later in the day, or on a different day, the starting weight of the new sample may be different, but the unit weight per volume of the final dried sample will remain the same day-to-day. Once the sample is determined to be sufficiently dry, subtract the weight of the sufficiently dried sample from the weight of the original representative aggregate sample. The resulting value is the weight of the moisture held by the aggregate. Be careful to use the value of the original sample and final dried sample only. Do not use the combined weight of the sample container plus the aggregate sample. Then divide the weight of the moisture held by the aggregate by the weight of the sufficiently dried sample. Then multiply this value by 100. The resulting value is the aggregate moisture content as a percent. Any necessary mix water adjustments can be made at this point. Compare the measured aggregate moisture content to its absorption capacity. This is usually found within the aggregate supplier documentation, which shows the aggregate’s conformance to ASTM C33, “Standard Specification for Concrete Aggregates,” or it may be found on the gradation documentation. A measured moisture content that is greater than the absorption capacity indicates the aggregate is wetter than the ideal saturated surface dry state, meaning it is holding free moisture on its surface in addition to having full pores. Free moisture needs to be accounted for in the mix design as additional mix water being added to the fresh concrete mix. A calculated amount of additional aggregate will need to be added to the mix to maintain the required quantities of raw materials and to achieve the expected yield. A measured moisture content less than the absorption capacity indicates the aggregate is dryer than the ideal saturated surface dry state, meaning its pores may be only partially full. A calculated amount of additional mix water will need to be added during batching to maintain the required quantity of raw materials and to achieve the expected yield. Performing aggregate moisture burns is an easy way to validate the moisture content of the aggregate being batched into each mix. The test provides crucial information about the moisture conditions of the aggregate in the stockpile, which will not only affect the water-cement ratio of the mix, but also the strength, watertightness and long-term durability and performance of the precast concrete product being manufactured. Routinely checking aggregate moisture content and making the corresponding adjustments to the batch values will save time, headaches, product waste and dollars by ensuring the mix design is adjusted as needed prior to dispensing the batch and performing the fresh concrete tests. Catching an out-of-tolerance value during fresh concrete testing may be too late. For more information on aggregate moisture conditions, how they affect a concrete mix, and how to calculate aggregate moisture content, watch the webinar, “In Any Weather: Adjusting Batch Water to Account for Aggregate Moisture Content,” available in the Online Learning Center at precast.org. You can also refer to the NPCA Quality Control Manual for Precast Concrete Plants for more information on the frequency of aggregate moisture content testing. In addition, read the September-October 2018 Precast Inc. article, “Concrete Mix Design: Proportioning,” for more information on how to conduct raw material and batch adjustments to account for aggregate moisture content. Kayla Hanson is NPCA’s director of technical services.